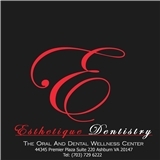 Esthetique Dentistry (Ashburn) - Book Appointment Online! When it comes to choosing your cosmetic or reconstructive dental specialist, experience and training counts. Dr. Garima K. Talwar brings not only many years of experience to Northern Virginia, but her dedication to cosmetic and full mouth reconstructive dentistry has won her many patients who experienced a life changing experience. Dr. Talwar is a Diplomate of American Board of Prosthodontics and a Fellow of The American College of Prosthodontists. Prosthodontics is a dental specialty which requires 3 years of additional training after dental school. The specialty focuses on complex cosmetic and reconstructive dentistry. Dr. Talwar is a member of numerous local, national and international dental organizations. She stays abreast of the latest advances in dentistry by regularly attending study clubs and faculty seminars in cosmetic, reconstructive and implant dentistry. i had a very pleasant visit with Dr. Hogan. She and her staff made me very comfortable right from the beginning. All the women were very professional and very friendly. looking forward to my next visit.